Short version: Joan Marie Whelan has been an intuitive — someone with innate accurate insight — since her earliest memories. Intuition can mean psychic ability, of course, but she doesn’t prefer the connotations that come with the latter term. She had trouble accepting her abilities until a traumatic accident 20 years ago led her to reconnect with herself. Joan Marie recognized she could turn her anticipation of events and connection to a higher power into a career that helped others. Nearly two decades later, she has taught hundreds of clients find love — by first finding themselves — and she’s turning her attention to reaching a larger audience through a book for teens, a television show, and even a romantic comedy. Intuitive Joan Marie Whelan understands that loneliness doesn’t just befall people who lack connections with others. Instead, it can happen to those with plenty of friends and relationships. But what can individuals do to feel more connected? Joan Marie explains that it’s all about developing a better understanding of yourself. She promotes improved self-understanding through multiple channels, including books, events, and online courses. 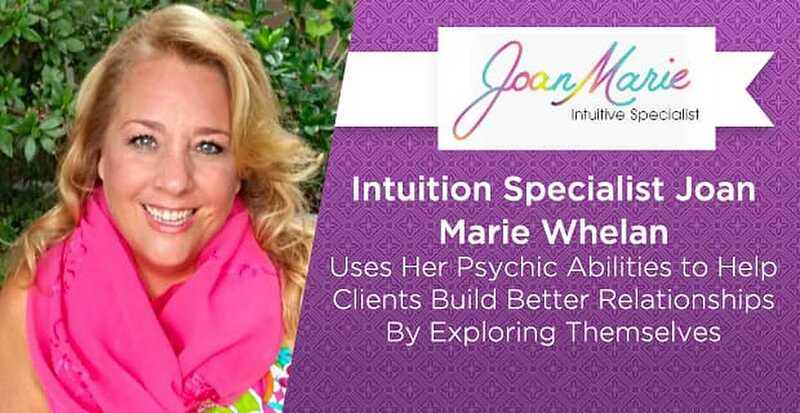 Joan Marie Whelan knew early on that she had intuitive abilities. If an individual wants to be in a relationship but is disconnected from that light, they may feel a sense of failure. Instead of searching for a partner, Joan Marie suggests they first connect with themselves. As an intuitive, she helps troubled individuals find the inherent purpose they lack. Sometimes, Joan Marie receives very detailed messages about clients from the high frequency with which she is connected. From early on in her life, Joan Marie could always make predictions that would eventually come true. Despite the innateness of her gift, Joan Marie never considered a career in the field of intuition — mostly because she didn’t know the profession existed. She also didn’t take her predictions entirely seriously, a failure of self-trust that led to one of the most significant moments of her life. “I was in a head-on car collision 20 years ago. I predicted the car accident, but I didn’t feel worthy enough to say we can’t leave the house today because something bad will happen,” she said. Joan Marie uses her special talents to help people understand themselves and find partners. After the accident, she had no choice but to take her intuitive ability seriously. Her predictions then became stronger and more persistent than ever before. As she found ways to better understand her abilities by reading about the brain, science, and medicine, she also found people interested in receiving her guidance. She met people through her medical training who urged her to start taking clients because they wanted to work with her. After she started taking on clients, her practice grew at a rate that was beyond her control. “I was just word of mouth. It was that easy and not planned at all. I had a line of clients out the door,” she said. Even if someone seems like a confident, self-assured person, he or she likely still have some deeper insecurities. Joan Marie uses herself as an example. We often hide the parts of ourselves we dislike or actively work to repair them, but Joan Marie helps people take a different approach, one that she took herself. She suggests opening up and embracing your feeling of unworthiness as a part of yourself. She said that once she started to love her own insecurity, it was gone. Honoring the different emotions in our bodies can help them be purified. That strategy worked for Joan Marie, and now she teaches others to appreciate their imperfections rather than dwelling on them. “We all have work to do, and we all have emotions, but the work is to love that piece of you, not to hate it. I get clients to cheer and love their issues, to celebrate them. When you feel whole within, someone else can connect with you, and learn to love you from there,” she said. Once people accept themselves, then they can form the kinds of bonds they’re looking for with others, and a healthy relationship begins with whole individuals, according to Joan Marie. “From a healthy place, you can accomplish anything you want in life. Some people are just craving to date or keep busy. They don’t want to deal with themselves, but the best thing you can do is deal with your emotions,” she said. Moving forward, Joan Marie has plenty of projects to keep her busy as she plans to bring her intuitive gifts and philosophy of self-connection to a broader audience. Joan Marie isn’t just entering one new media sphere, but two. Her book for young adults called “Intuition Girl” is forthcoming soon. “I want every woman to know our bodies are ours. It doesn’t belong to your partner. I think it’s important for young women to respect their bodies and honor the sacred goddess temple of being a woman,” she said. No matter how many fields she enters, though, Joan Marie still holds onto a singular message. You can reach Joan Marie Whelan via her website, www.joanmariewhelan.com, or telephone number, (941) 954-9001.